Stephen King is my thing. These crows have wings and like to peck at things. I eat chicken wings. Be thankful I’m just a movie-loving monster and not a rapper. 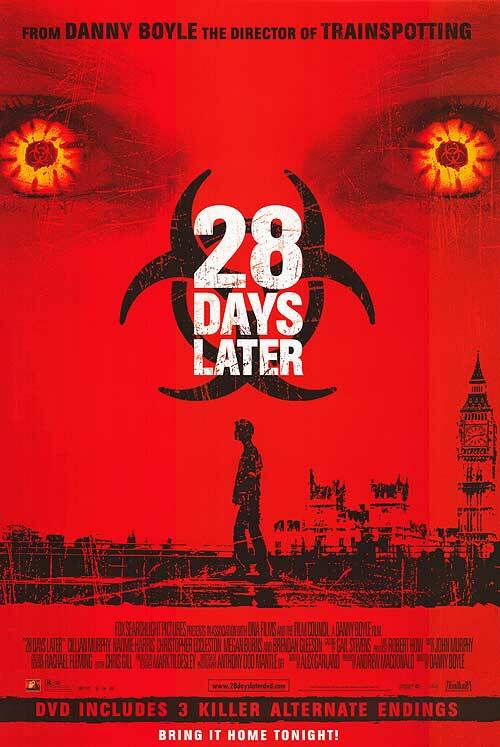 Danny Boyle’s (Slumdog Millionaire, Trainspotting) 2002 British zombie horror 28 Days Later is a benchmark in the history of the genre. I remember seeing this for the first time over a decade ago. Even at a young age I noticed how it stood out from the other schlock and set the base standard for what modern zombie-themed productions (like The Walking Dead) are today. It is what I would call Boyle’s most important and impressive film to date. It was released at a pivotal point in The Manster’s life, that’s for sure. Many would consider this, along with the 2004 remake of Dawn of the Dead, to be what made The Manster who he is today!